Offered are a signed Mid-Century Modern Italian MIM Roma/ Ico Parisi by Luigi Pellegrin sectional sofa newly upholstered in a soft yellow wool Knoll fabric and newly refurbished black fiberglass base. 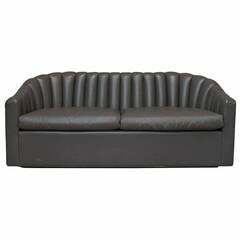 The offered vintage MIM Roma sectional sofa by Luigi Pellegrin is an iconic example of brilliant Italian MCM design. MIM Roma was founded in Rome, Italy in 1957, with plans by Ico Parisi for the “integration of the arts” within furniture design. 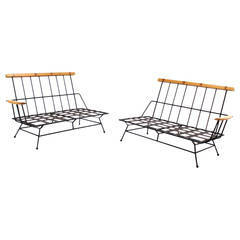 Under Parisi’s watchful eye, young designers of the time, such as Luigi Pellegrin, designed furniture with an intentional approach to modern design that incorporated very new materials to the post WWII market that would influence future generations of Italian furniture designers. This sectional is in two parts and can be configured in many different ways. The newly upholstered sofa (the new Knoll fabric is similar in feels and color as the original) sits cantilevered above a newly refinished black fiberglass base. 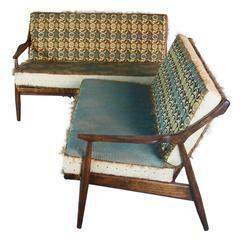 The base of the upholstered portion sits upon two platforms one of material and the other of tightly formed springs. The seat cushions snap into place upon the top seat platform. This piece is of museum quality! Very good vintage condition. Completely refurbished while respecting the integrity of the piece. Light wear to base from sitting on the floor of the showroom. Offered is a Mid-Century Modern manner of Ward Bennett signed Jack Lenor Larson, beautiful and elegant channel back leather petite sofa in a rich milk chocolate colored leather. 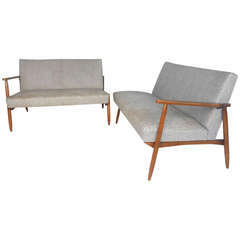 McCobb style Mid-Century Modern sectional sofa. As is upholstery. Perfect wrought iron frame.